Sensebridge - making the invisible visible » Blog Archive » Maker Faire! 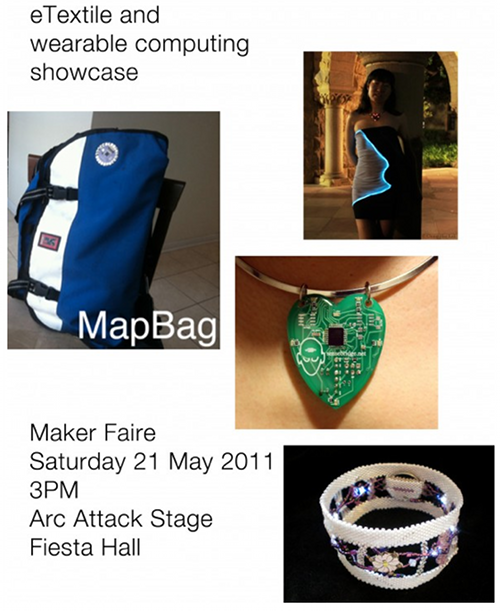 Heart Spark is going to be featured at Maker Faire! Maker Faire is this weekend, May 21 & 22. The Heart Spark will be in Lynne Bruning’s eTextile Showcase and at the eTextile Lounge. North Paw will also be at the faire, at the Noisebridge booth. You won’t be able to buy either of them at the faire, but as always you can purchase them online right here :-). I’m super excited for the Maker Faire, hope to see you all there! Our friend Meredith, the Lady Cartoonist, will also be there, showing off her starboards – you might remember her from the North Skirt. Finally, I’ll (Eric Boyd) be giving a talk on the future of sensors at the upcoming Quantified Self Conference, the week after Maker Faire. There are still a few tickets left. Can’t wait to hear your presentation! What you are working on is absolutely the future of personal data!